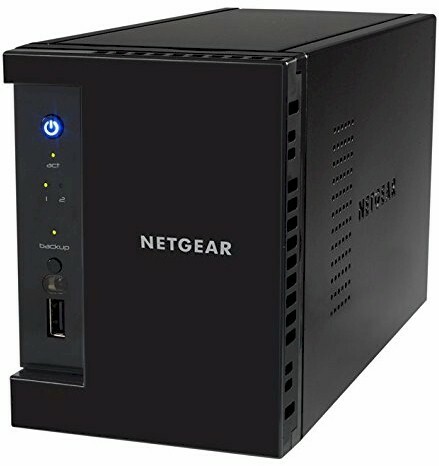 NETGEAR announced its ReadyNAS 200 family at CES 2015. The RN202 and RN204 models are basically more powerful versions of the ReadyNAS 100 family we reviewed in the form of the RN102 about two years ago. In this review, I'll be looking at the two-bay RN202. From the outside, the RN202 looks identical to the RN102, but features an updated processor as well as 2 GB of RAM. In addition, all three USB ports on the RN202 are now USB 3.0, and the RN202 adds a second Gigabit Ethernet port capable of link aggregation. The RN202 also supports 6 TB disks. The table below summarizes the key differences between the RN102 and the RN202. The image below shows the front (left) and rear (right) panel callouts. On the front panel, there's a Power LED (top), disk activity LED, single USB 3.0 port, backup button, LEDs for USB and backup status as well as individual status LEDs for Disk 1 and Disk 2. On the rear panel, you'll find two USB 3.0 ports, two Gigabit Ethernet LAN ports with LED status indicators, eSATA port and a Kensington lock slot. The fan and power connector round out the rear panel. The image below shows the main board for the RN202. The heatsink has been removed to show the processor. The RN102's key components are summarized in Table 1 along with a comparison to the ASUSTOR AS5002T and the QNAP TS-251 Turbo NAS. All of the three NASes have very similar price points and performance and will be used for comparison throughout this review. As an interesting side note, this is the first NAS we've reviewed that features a CPU from Annapurna Labs, an Israeli chip maker. The ReadyNAS 200's are likely to be the last NASes we'll see with these processors, because Amazon purchased the company at the beginning of this year.